In Chemainus BC, you can dive on a Boeing 737 jet plane, that was sunk in early 2006 to make an artificial reef. This dive site is boat access only as it is a long way from shore, and is located just outside the downtown area of Chemainus. There is a boat ramp at the end of Maple street beside the Kin Park. Which by the way is great for kids and picnics. and it is only minutes from the dive site. Otherwise you will likely be putting in at Ladysmith. This is a much longer run, but the ramp is much better for a bigger boats and trailers. As this update (Dec. 2016) launch & parking is free in Ladysmith as well. Go to Dive Site Directory from the boeing 737 jet plane. This is quite an interesting dive, as not to many of us in these waters get an opportunity to dive on a large sunken jet plane such as this. 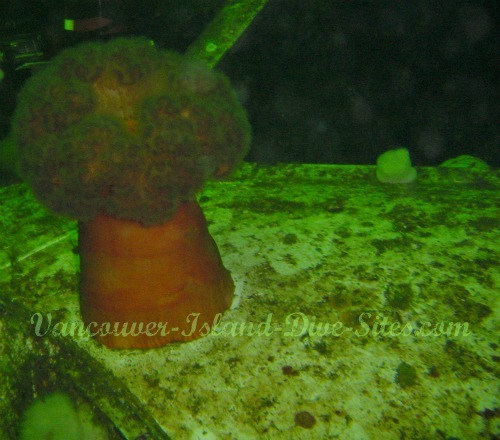 The project was coordinated by a fellow named Peter Luckham, and the Artificial Reef Society of B.C. A big thanks and Kudos to them both for backing this project and creating such an excellent dive site. The jet plane is sitting up off the bottom on some giant tripods, and is totally accessible top to bottom if you so desire. It certainly makes for some great photo opportunities! Remember that if you plan on penetrating this, or any kind of wreck with an overhead obstruction, you should probably have the extra training and equipment. I will add that the doors have all been removed and it is extremely easy to access the interior of the plane. The Boeing 737 site, is marked with a large yellow can buoy for tying up, and then there are a couple of floats tied directly to the plane to aid you in getting down to the wreck. This can be a hit or miss site for visibility, so you might want to save this dive for early fall, winter, or early spring. You can be fairly sure of the visibility in this case! If you still have another dive in you and you like dungenous crab, try your luck on the opposite side of Bear Point down by the houses. There is often good crabbing to be had, if you are quick! Have fun and dive safe! I promise to use it only to send you diver-dons E-zine. and right up to Alaska. You to can Build a Successful Website! Follow this link to find out how?